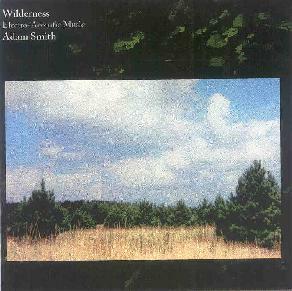 Adam Smith is a multi-instrumentalist, composer, and studio wizard who, on Wilderness, puts together a strange and unique collage of classical, jazz, electronic, and musique concrete. It's at times eerie and edgy, and at other times, haunting and evocative. The title track gets things going with languid, sometimes dissonant strings and jazzy brass. Sound effects merely touch the piece, marking musical turns of phrase, mostly creaking doors and footsteps, as if we are closing that passage and moving on to the next. In fact, unlike many new age composers, who are content to let a soundtrack of pleasant sound effects run along in the background while they noodle over top of it, Smith chooses and places his sound effects very carefully, making them part of the composition. Episode and Masque are both shorter pieces (in the three minute range), the former being more or less a continuation of the ideas developed in the title track, the latter a foray into the bizarre. Masque is a piece for "solo tape", and consists of sounds (presumably created electronically-they sound a bit like marimbas) manipulated with tape, occasionally interrupted by shivering winds. In complete contrast is the 10-minute Afterward, a moody, stirring composition for brass and jazz ensemble. It glides along with almost processional grandeur, before shifting into numerous other moods, from quiet club-style jazz, to big, orchestral flourishes. It could almost be the soundtrack to some forgotten 70's melodrama. Beautiful! But for me, the highlight of the album was the 22-minute epic, Snowpine Mountain. Here, Smith takes us into deep electronic realms. Sound effects from nature drift in and out; birds and winds. What I really like about it, is that Smith absolutely refuses to get into a groove and let the machine do the work for him. This is exploratory music, constantly shifting and changing in mood and tonal quality, from the sublimely beautiful to the cold and frightening. If anything, it captures nature in its truest neutral form. The final piece, Twilight, seems almost a coda to Snowpine Mountain, borrowing some of that pieces moods to create a spacey, lulling composition for synthesizer and organ, that bears some vague Vangelis-like accents as it finally drifts off into the night. In the last few years, I admit, I've grown a little weary of the ambient music scene. But I would definitely recommend this album to others who feel the same as I do. Smith's challenging electro-acoustic work re-invigorates the genre by taking it to the next step, something few musicians in a well-established style have the courage to do. For more information you can visit Adam Smith's web site at: http://www.geocities.com/adamsmithmusic/index.html. Hear sound files at Adam's Mp3.com web site at: http://www.mp3.com/adamsmithmusic. Contact via snail mail c/o Adam Smith; 279 East Beechwold Blvd; Columbus, OH 43214.